What to serve at your event? Is that question driving you crazy? You’re not alone! Being the coordinator of a club or company affair is stressful. It can be incredibly difficult accommodating the tastes of the people invited. Serving charcuterie can simplify the food planning at your next event. Charcuterie appeals because it works with people’s love of both salt and fat. Charcuterie refers to dry-cured, smoked and cooked meats. As it has become more popular, the range of foods included has widened considerably. Your choice of what to use is wide open, making this a versatile part of your menu. It appeals to a range of palates, from plain to gourmet. One of the biggest advantages of charcuterie for an event coordinator is how flexible it is. Once you get the food arranged on the boards, refrigeration isn’t essential. All of it can be served at room temperature. It is the perfect choice for events with a lot of coming and going, like receptions and networking situations. People can help themselves to the food easily and it is easy to eat without creating a mess. You can dress your board up or down with specific foods that appeal to your particular group. Meat and cheese is at the heart of every charcuterie board. From there, use your imagination for foods that add to the enjoyment. It can be tempting to put lots of everything on your board, but don’t. Overloading your charcuterie board makes it too hard for guests to get to the food. Aim for three to five types of meat on each board. For example, include a cooked pork sausage, a dry-cured meat and a dry-cured sausage. Don’t be afraid to experiment with turkey or ham. Include a range of cheeses, from soft to hard. People love to investigate different textures and tastes. Try including fresh cheese like mozzarella, soft like brie or camembert, semi-soft like Havarti or asadero, firm like cheddar, and hard like parmesan. After you decide on the meat and cheese, supplement it fun foods like pickles, which go well with most meats and cheeses. Beside basic dill and sweet pickles, consider pickled onions, asparagus, carrots, beans and even garlic! Specialty mustards and preserves are an excellent addition. How about hot pepper jelly, or homemade chutneys? Fruit gives palates a rest from the salty flavors. And cheeses work so well with pears, apples, even dates and figs. For example, goat cheese and pear slices make an excellent pairing. This is the time to showcase sliced artisan breads. You can also use crostini and crunchy crackers. For those going gluten-free, add some rice crackers. You need one board for every five to seven people. Wood is the standard for charcuterie. Plastic and ceramic platters give off another note entirely. A plain wood cutting board is fine for charcuterie. But why not show off your food with rustic and attractive live edge cutting boards? The term “live edge” refers to the natural side of the board, which follows the shape of the actual piece of wood. Live edge cutting boards display your charcuterie in a sophisticated way. The style is natural and goes with all types of decors and themes, from modern to classic. 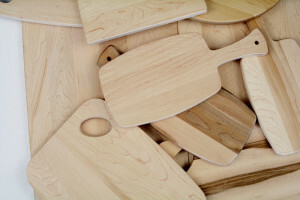 Wholesale Cutting Boards has a wide range of live edge cutting boards for your event, in many shapes and sizes. When you buy in wholesale lots of 50 or more, you can save significantly. The design team and craftspeople at Wholesale Cutting Boards have years of experience producing beautiful, durable boards. They are easy to maintain and keep their good looks for decades. Call or email the team at Wholesale Cutting Boards today for a free, no-obligation quote for live edge cutting boards for your next event.